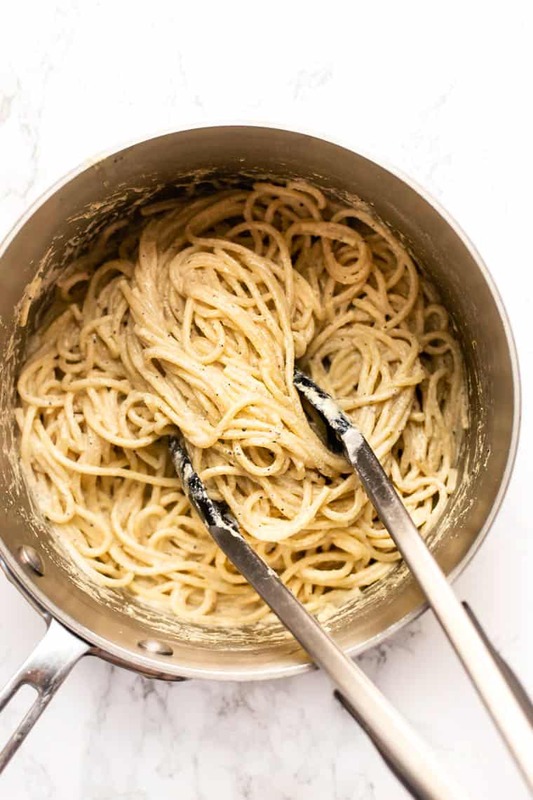 How to make Vegan Cacio e Pepe. 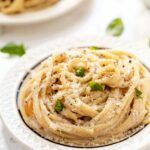 A healthy version of the classic Italian, this creamy vegan pasta is full of flavor, super peppery and seriously delicious! A few months ago I went out to LA for a conference and met up with a friend for dinner at Plant Food and Wine in Venice. It's a vegan restaurant and as soon as we sat down, my friend that we had to order the kelp noodle Cacio e Pepe. Oh em gee. My love affair with pasta reached a whole new level after tasting that dish. No joke it's one of the best pastas I've ever tried. And as soon as I tasted it, I knew I wanted to recreate it for you. So that's what we're doing! 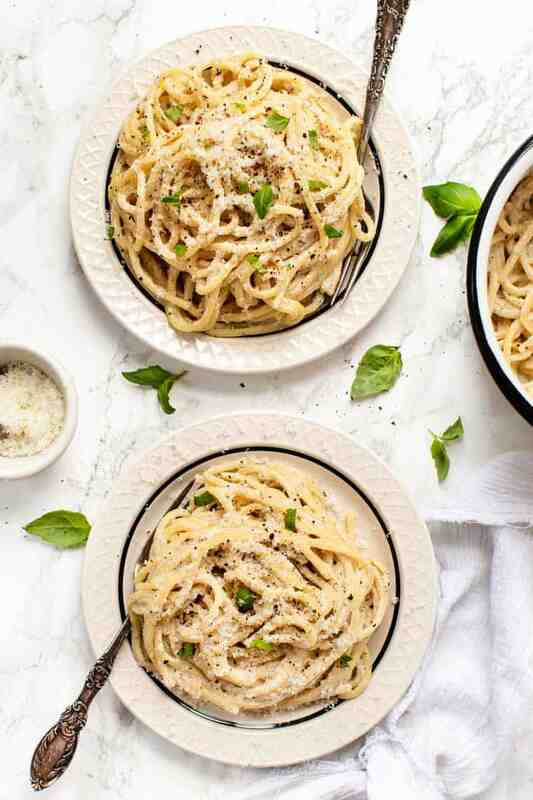 I'm giving you my own version of a vegan Cacio e Pepe with gluten-free pasta, a peppery vegan cream sauce and sprinkled with a touch of fresh basil. 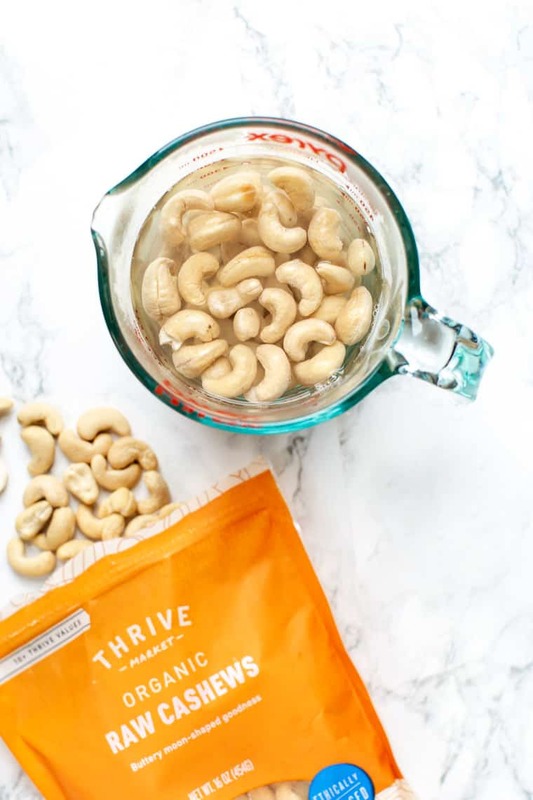 Why do You Soak Raw Cashews? First things first, let's talk cashews! You've seen me use cashews many times before in my “creamy” recipes (like my White Quinoa Chili and my vegan lemon creamy sauce) and it's because, when blended, raw cashews have the most luxurious, smooth, creamy texture. They lend themselves very nicely to making vegan cream-based recipes. However, the trick with raw cashews is that you need to soak them. Because we're going to blend them, soaking the cashews ahead of time softens the flesh of the nut and makes it easier to blend. I recommend soaking cashews overnight, but if you're short on time, simply pop them in some hot water for two hours and you should be fine (especially if you have a high powered blender!). One thing to keep in mind is that raw cashews can be a little pricey. I buy mine from Thrive Market because they're organic, raw and way cheaper than anything else I've seen in stores! They're typically at least 35% off which is an incredible deal. In fact, I recommend checking out all their nuts and seeds because they're always cheaper than what you see in stores. p.s. 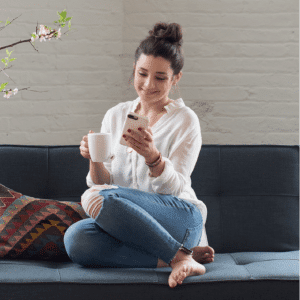 want to try Thrive Market for yourself? Get 25% off your first order + free shipping by shopping through this link! Once you've got your cashews nice and soft, it's time to make your sauce. Like most vegan creamy sauce recipes, we're using our handy dandy blender! And then we just blend it all up with some water and call it a day. Honestly, couldn't be easier to make! 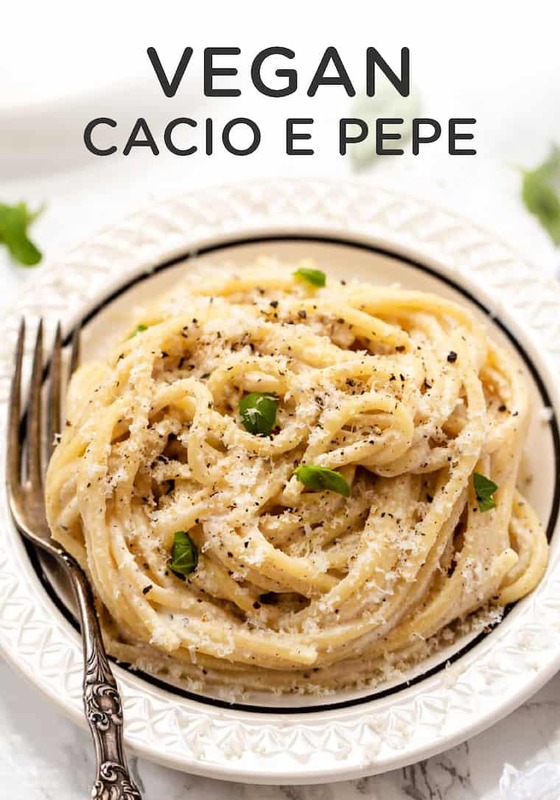 Cacio e pepe is a classic Italian pasta dish that comes from Rome. Its literal translation is “cheese and pepper” which is exactly what it's made with. It's one of the easiest pasta recipes to make because it's so simple. Traditionally, you would only use 3 ingredients: pecorino romano cheese (which is usually a sharp sheep cheese), pepper and pasta. That's one of the things I adore most about Italian food; it's simple, yet delicious! 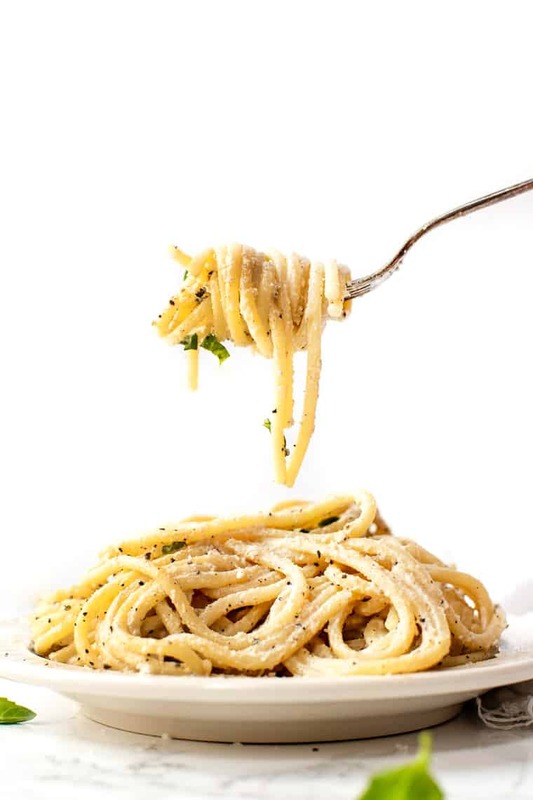 For our vegan cacio e pepe, we're swapping the cheese for our vegan cheese sauce. While it's not exactly like the original, it's still got that satisfying creaminess, that spiciness from the pepper and a simple ingredient list. But what's also great about this recipe is that the sauce is actually super versatile. It's obviously SO good on pasta, but it could also be used as a base for white pizza, in lasagna, in a baked “mac and cheese” style dish, or it could even be thinned out and used as a salad dressing. Either way, I think you're going to adore this dish! It's so comforting but also feels really light, which is great for this time of year! 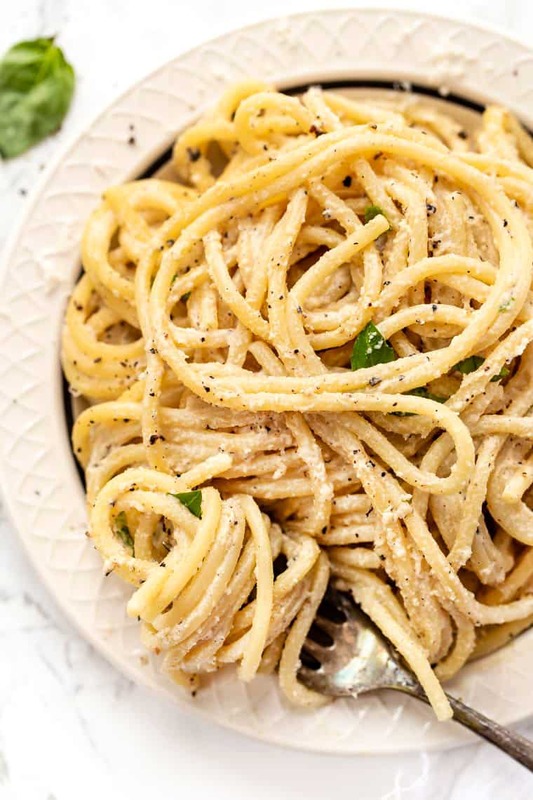 This vegan cacio e pepe pasta is a healthy version of the Italian classic. Made with a base do cashews, this creamy vegan pasta sauce is loaded with flavor, super peppery and delicious! Add the cashews into a bowl and cover with hot water. Allow cashews to soak for at least 2 hours. When ready to make the sauce, place a pot of water to boil on the stove. Once boiling, add the pasta and cook according to the package instructions. While the pasta is cooking, drain and rinse the cashews. Add them into a blender along with the remaining ingredients. Blend on high until smooth and creamy. When pasta is done cooking, reserve some of the water, and then draining it. Add the pasta back into the pot along with the sauce and 1 - 2 tablespoons of pasta water. Toss to combine. 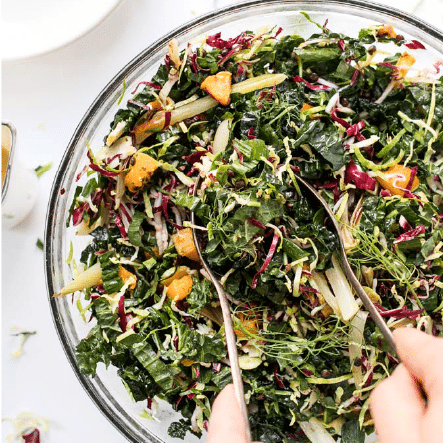 Serve immediately and garnish with desired toppings. Get 25% off your first order + free shipping by shopping through this link! 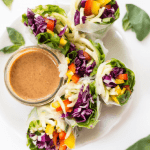 And thanks to Thrive Market for sponsoring this post. As always, all opinions are my own. I only share companies I love and trust, so thank you for continuing to support Simply Quinoa! I have just come across your page today, think there is plenty for me to discover here 🙂 one question, do you use white or dark miso paste? 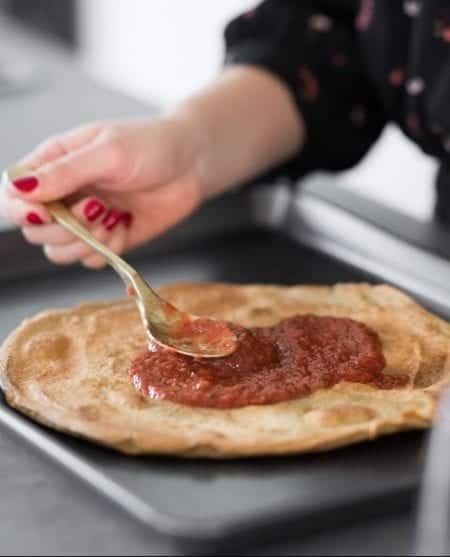 I only have the dark one (I live in Switzerland so not available everywhere) and so am curious if you have both miso pastes and if you use them differently. Thanks! Hey! I definitely want to make this 😊 But I’m wondering… with the soaked cashews, do you add them and the water they soaked in to the blender? Or you pick them out of the water? Thank you so much! !